Scroll down for additional information about the events listed on our calendar. To view bios for the Three Tenors of Climate Change , visit our events page. 2019 marks the 15th Bear River Cleanup! Join Watershed Council staff and community members as we clean up trash and debris from the Bear River and its surrounding area. This event is free to attend and all pre-registered volunteers will receive a complimentary t-shirt. Last year, 150 community volunteers collected multiple truckloads of trash and recyclables from the River. We need your help to make this year, the 15th Cleanup, the biggest ever! REGISTRATION OPENS JUNE 1st. 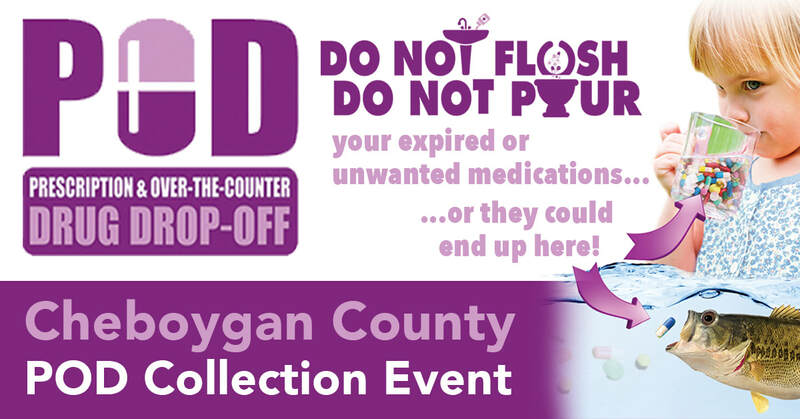 All above events are held from 9:00 a.m.-1:00 p.m.
Improper disposal of unwanted and expired medicine can pose a significant danger to our Northern Michigan’s waters, community, and families. The best solution is to dispose of old and expired medications is through Northern Michigan’s Prescription and Over-the-Counter Drug Drop-off (POD) Program. McLaren Northern Michigan will be hosting POD Collection Events at their Cheboygan Campus on the dates listed above. In addition to your unwanted and expired medications, this event will also be accepting sharps, cell phones, shoes, eyeglasses, hearing aids. If you are unable to attend this event, a number of POD Collection boxes are available throughout Northern Michigan. For a complete list of locations, drop-off times, and items that are acceptable in POD boxes, visit www.pillsinthepod.com. All above events are held from 7:00 a.m. - 4:00 p.m.
McLaren Northern Michigan will be hosting POD Collection Events at their Petoskey Campus on the dates listed above. In addition to your unwanted and expired medications, this event will also be accepting sharps, cell phones, shoes, eyeglasses, hearing aids. Did you miss our winter Ice Breaker Winter Speaker Series? You can watch the presentations that you missed on our YouTube Channel.